Hands up if you have seen the awesome 80s classic The Breakfast Club? High school kids stuck in detention, all different types, don’t really know or like each other and then they are all stuck in the same room and end up having this amazing experience? WHY NOT??? This film is fab and I demand you go and watch it this evening…. The other four narrate the story and all have something to hide. Simon is the author of an online gossip website called About That and has been writing nasty things about other students, he isn’t exactly Mr Popular. So when it’s discovered that he has been deliberately killed they are all under suspicion. Bronwyn is the clever type who is just trying to get though high school and into Yale. Cooper is the star baseball player who is just about the get a full scholarship and possibly play in the majors (this is important if you play baseball apparently) Nate is the school drug dealer and lives with his alcoholic dad, his mum has disappeared. Addy is dating Jake, a thoroughly nasty jock who is a total control freak. That basically sums up Addy’s personality at the beginning of the book. As things play out and the students all fall under suspicion they start to get together to figure out what really happened. As they start to trust each other more, and spend more time together, there is a lingering suspicion that one of them may have committed the murder. So who did the crime? I liked the way that, as the reader you experience all the main suspects in their own words, which makes it more difficult to figure out which one (if any) of them might have done it. 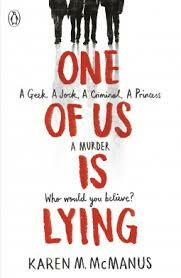 As the groups secrets are exposed and some of them get a bit closer the suspicion heightens. Although I never really believed that any of them were guilty, the lies came out quite slowly so it was exciting to go along not knowing who the murderer was. I also started to really like the characters and really hoped that none of them were responsible! 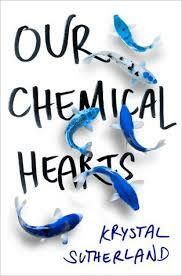 This is another YA book that references classic stuff but also is trying to encourage you to be an individual. Addy in particular is in an abusive relationship but doesn’t even realise it. Cooper’s secret also exposes the fact that, although American is a first world country, it still has some backward thinking going on! The twists and turns made me want to finish quickly and I really enjoyed the ride. A good thriller that will make you go ‘oh!’ when you find out the truth! One to read over the summer I think. Now go and get The Breakfast club on Netflix , if you love Pitch Perfect hopefully you have seen it already! This was an interesting read after reading Between Shades of Gray. 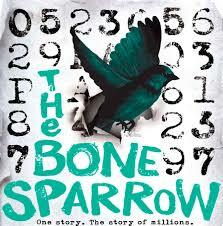 Both are set in detention centres, one during the second world war and the other, The Bone Sparrow, set in the present day. Present day Australia to be precise. The characters in this book are from Myanmar/ Burma and are part of the Rohingya people, one of the most persecuted groups of people on earth. They have been expelled from Myanmar as the government there have classified them as illegal immigrants as a result of the ongoing civil war. In 2015 all Rohingya people were expelled from Myanmar and it caused a humanitarian crisis with thousands living on boats as they were effectively stateless. Many ended up washing up on the coast of Australia where they are still being held in detention centres. If you are in a detention centre in Australia you will never qualify as an Australian citizen according to the afterword in this book. Ever. What will happen to the people who are in there is anyone’s guess. So, there’s your background, taken from Wikipedia so who knows how accurate it is! The point is that these people have no hope. The main character is a small boy called Subhi. He is probably about 10 years old and was born in the detention centre. He lives there with his mum and his sister Queeny. She isn’t really called Queeny but that is what everyone calls her. He lives in the family section of the detention centre known as family 3. Also living there is his best friend Eli, who is a little older then him. Eli is a bit of a ducker and diver and manages to acquire things that other people need. The conditions in the camp sound pretty horrendous and, although Subhi doesn’t really know any different, he knows that they should not have to live like this. There are other sections of the camp, mostly all men sections and one for people who try and hurt themselves. Subhi’s Maa is very depressed and seems to spend all day in bed starring at the wall. His dad, or Ba is not with them and it’s not very clear where he is. The other narrator in the book is an Australian girl called Jimmie. She lives with her brother, Jonah who is older than her, and her dad. Her mum has recently died and they all a bit of a mess. Jimmie’s sections aren’t very long but they are interesting. They are not really an antidote to Subhi’s situation and she is suffering from neglect by her dad, who seems to be suffering from depression as well. She rarely goes to school and as a result cannot read. She carries with her a book of stories that her mum has given her about her family history. One day she decides to explore down the road by the camp and manages to hop the fence. That’s where she meets Subhi. Subhi can read her stories and she discovers things about her family and where they came from. She also wears a sparrow necklace and the stories explain to her the origin of it. Things in the camp in the meantime are hotting up. Eli is transferred to the male wing, even though he is clearly not an adult and the men decide to go on hunger strike. Things start to get nasty for Jimmie as well when she picks up an infection. The relationship between Subhi and Jimmie is lovely. The plight of the people suffering in the camps is horrendous and little known. The bigger question is what can we do with all the displaced people in the world who cannot go back to where they were born, but cannot live in the country they have ended up in. The refugee crisis in Europe is much closer to home but no less disturbing. A thought provoking read, like much of the Carnegie shortlist this year. I enjoyed it more than I expected to. PS> my favourite character is the plastic duck… he has a great sense of humour.